So yeah, that loading screen in Fortnite has more than one hint and this time the knife is where the treasure you seek is. The location isn’t as full of details as the one hinted on the magnifying glass, but it will still reward you with a Battle Star for your troubles. This guide will show you exactly where to go and what you’ll find there. In the third week of Season 8, there is a challenge to head to a location based on the image of the loading screen with a Treasure Map. This loading screen is unlocked at Tier 10 of the Season 8 Battle Pass, so you will need to do a tiny bit of work in order to unlock it. Once you do though, you’ll see that the loading screen features a magnifying glass, highlighting a circle of frees close to a mountain with a tower. Seasoned veterans will know where that is, but below is the location you’ll need to visit, along with what you’ll find at the location. The location that you want to search in is in Grid Reference J6. There’s a dark patch that’s just between the race track in the desert, and the abandoned mansion in the grassy area. Trees surround the dark patch, but as soon as you approach the muddy area, a Battle Star will form. Sadly there’s nothing else here interesting, so pick up the Battle Star and move on. This concludes our treasure map Battle Star location guide, but there’s plenty more challenges to complete in Season 8. You can find out where to find the location for the area highlighted in the magnifying glass in our Fortnite Treasure Map loading screen Battle Star location guide. 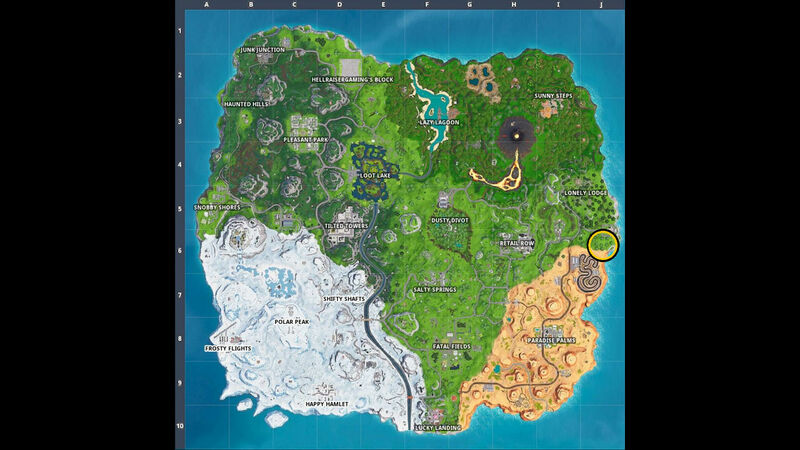 You can also visit the Giant Faces in their respective mountain tops by going to the locations highlighted in our Fortnite Giant Face locations guide.